Small dreams - looking for house layout advice. Here's the outline plan for my teeny house. Scary posting on here because I know my build has huge limitations but everyone has been so helpful already. It's very small but perhaps that also makes is very simple? I'm due to see the architect soon for consultation prior to full planning however it would be really helpful to gain any insights anyone might have into the best use of space and design. It's quite compromised by the parking requirements. I know there are probably easier plots to work with but none that fit my budget in the area I need to be. Luckily I'm not too fussed about a small garden. Sorry there are no actual measurements apart from on the house plan itself. The front elevation is south facing. The east elevation can't have any windows as its set against the boundary with the host house. The planning department is not keen on allowing an upstairs however I wondered if it might be considered if I only keep two bedrooms - one upstairs with a bathroom and one downstairs with a shower room. I'n not sure of the correct terminology but the planning is subject to no automatic right for permitted development rights for loft conversions etc otherwise I'd just add that in afterwards. The plot is what it is. I would change the layout Have living room and Kitchen / diner at the front as two separate rooms one either side of the hall. That way the main living rooms get the sun. If the one to the left (west) is the living room you could have a window or even patio doors onto the side garden to get afternoon sun. Then have the bedrooms at the back either side of the bathroom with the north facing windows. I did some work in a bungalow with that layout last week and the layout seemed to work well. A variation would be double doors from both the living room and kitchen diner into the hall, then by opening both doors to each room you can pretty much open those up as one big space when you want to. I would also build the roof with attic trusses to allow for a future room upstairs. Think how you might add a staircase to serve that later on and build it so that is easy to convert later. Thanks ProDave - I'd be considering double doors on the west side to maximise the sunlight and also possibly not having a hall all the way through so that the stairs could go in the hallway space instead. Is this the design that came with the plot, or the one that you have had architect designed? And which area of the country are you in ie which County? Are they houses or bungalows next door? The design was just the one that the architect drew for the plot sellers in order for them to gain planning permission. A previous bigger design in a slight different place was denied permission. I imagine I'll be going to the same architect for the plan for full planning. The plot is in Suffolk and the rest of the street is mainly brick 1960's semi's although there are two other detached bungalows built upon previous garden plots. The building by the parking provision is the garage of the other house next door which is co-incidentally for sale. I'm hoping to put my caravan [builders office] on the parking places during the build as the plot is tight. I don't think the proposal is that suitable for the site, and you could potentially do quite a lot better, so I will come back with some ideas to give a different viewpoint .. hopefully by tomorrow. I would say that the existing proposed plan looks to be as inoffensive as possible in order to get through PP easily. An example of something imo not very good is that as it stands you essentially have no all day outdoor space which is both sunny and private. Another is that the route from your car into the house with your shopping is a very long way in the rain. Another is that the route from your car into the house with your shopping is a very long way in the rain. I think I would be looking at running a path from the gate into the garden to the patio doors TBH. Or park up in the road, unload the car, then park in the alloted place. i would look at something more like turning the parking space into a covered car port, with the house as far north on the plot as possible, directly entered from the north, and you walk through from that side to a private south facing generous courtyard garden. In its way it is quite a spacious plot .. if used efficiently. But I have not worked it through yet, and it may depend on things like where the council will allow two metre walls or fences. To me the existing design is what I expect.by renovating a small 1950s bungalow when I remove one wall and add in one set of patio doors; mine was exactly like that before it was renovated. A new build should imo have fewer compromises. I suspect the problem with "turning it around" to try and make a private south facing garden, is it would in reality be a front garden and I doubt anything other than a low fence would be allowed. Sticking with more or less the existing layout you can achieve a west facing private garden, and if you are out at work all day, a west facing garden is just what you need for the evenings, If they won't allow a tall fence to give privacy then a hedge is your friend. I suspect planning won't allow more than 2 bedrooms because you can't reasonably park more cars. But a later loft conversion might be possible under permitted development. (I hope @simplepimple does not mind us debating the plot like an exhibit in an experiment 😁, but that is where new perspectives and insights emerge from at least for me !). Looking at the plot, it is really on a curved 90 degree corner - so there are probably TWO building lines, even though the Planning Permission shown only really reflects the one on the South side. Assuming that fence on the West is 2m, I agree with you wrt to a West facing garden. The insights needed here imo are from tight plots in built-up areas. 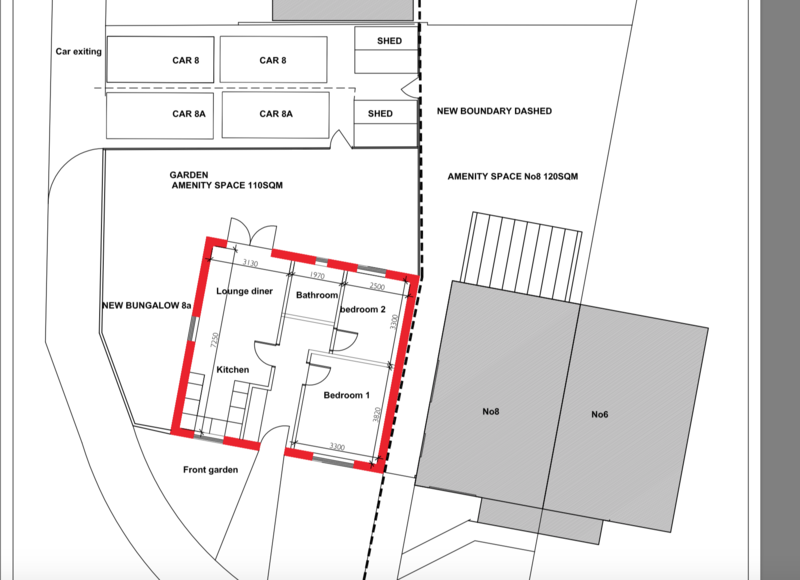 If the bungalow is moved up to join the parking spaces, then a private sunny courtyard garden the same size as the existing shaded North side garden can be created within the current indicated S-side building line as well as the private garden on the West side, And it may be that that could extend further South too. Classic "house placement on tight plot" practice says put it as far to the non-sunny corner as possible, and leave the sunny or non-shaded sides as your garden that can be seen from the house - in this case the latter are the West and South sides, which face the road. Privacy on the South Side right up to the pavement can be achieved with a fence / wall (subject to PP) or with a hedge (perhaps with a hedge outside a fence). But a wall / fence can surely be built along the building line, which gives a private sunny garden as large as the current shaded Northern garden. That must be a better layout. The other obvious layout thing may be to put the parking on the South Side to do something useful with the non-prrivate area S of the Building Line, which lets the bungalow or house to be put where the parking is currently - and that gives space for a larger building footprint or even better private and sunny garden. Personally I think a roughly L-shaped or similar layout, or an enfilade layout, would work well right in the East Side or North East of the plot, which gives sun through the largest proportion of the day. Remember the discussion we hadback in 2016 (and before that in 2014 on E-Build) about my studio bungalow, which is on a plot with two sides against public roads or paths. The design is below. Imagine this at the RHS of the plot in this thread, with minor adhustments. How big are those car parking spaces? 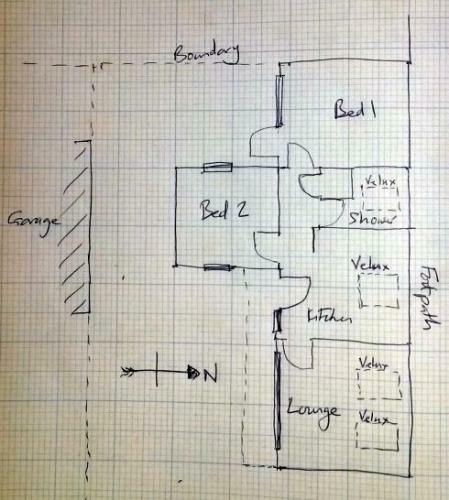 The plan as shown makes them - together - the same length as the width of the bungalow ie about 8.5m. It's a bit of a diddle, as that is not legal. If you ignore the space for the gate to open, and go right to the wall of the shed, you have the legal minimum *just* ie 10m. To go inside the spaces as drawn - and assuming a gap between the cars of 6 inches, and to be 6 inches back from the kerb, and 6 inches from the shed wall, you can *just* get 2 Minis on there. And you will then need the gate opening the other way, and to move the Minis to get to the shed. Seems like the council are removing automatic rights for permitted development in respect of a loft conversion. I still don’t get the council’s objection to a dormer bungalow in a road full of semis. And lots of houses only have 2 parking spaces. The terms of my PP were that I had to make provision for 2 parking spaces which is ridiculous for a house this size. As it happens there is space for several cars but I only had to provide 2, and there was no garage on the original PP, it was added later under PD. The normal rule is something like 2 spaces for 2/3 bed, and 3 spaces for 4-bed. Another material inaccuracy on the plan afaics ... next door are misrepresenting their amenity space. It says 120sqm, whilst putting a measure on it says something like 60sqm if that grid thing on the back is a conservatory, and about 75sqm if it is a patio. It may be that some of these misrepresented aspects have got through outline, but tmay be questioned at detailed planning stage .. so take your time to be sure. Visually, just compare the fifty sqm footprint of your bungalow to their back garden and it sticks out like a sore thumb. I would suggest taking great care on measurements etc. Do not let them peg out the plot for you, or you could get scalped. BE particularly suspicious of the width of their parking area, the position of that gate, that you are getting all the width of your plot, and where the edge of the pavement is taken as being. If you have not signed on the dotted line, I would get a check that your 110sqm is accurate. I think you are actually getting slightly under 80 sqm, which is a quarter less than you are being told if accurate. Potential negotiating point imo rather than a withdrawal point imo, it is still a very nice plot. Amenity space is private, and it does not I think I nclude sheds, storage, parking outside your privacy fence, or narrow areas which cannot be sued practically or access paths. Thank you so much for all these insights. My conveyancer has tried to gain further clarification regarding the parking size however the council planning team won't comment as there currently isn't enough information and the sellers solicitor says they are not prepared to pay for further work to gain this. They said the plot is only sold with outline and if I don't want to continue with the purchase [almost ready to sign the contract now] they'll put the whole [plot and their house] on the market. When I originally saw it I presumed we'd both be able to park on the front because naturally that's where you would choose to park. There were complaints from the neighbours in respect of parking [despite them all having their own drives] and also the town council didn't want the planning to be approved on the grounds that the street could be over developed. Ferdinand has it spot on regarding it being on a corner plot and whilst I love the idea of turning it around Pro Dave is correct in that they might not permit an enclosed front garden - perhaps a hedge could get a bit out of control though. I don't have any actual measurements either - surely that should be standard prior to purchase? The sellers also used an agent to get this one through - not sure if that makes a difference or not. I'm happy to attach the previous refused plan if it would help. You are all amazing - thank you. It is beginning to sound like some "imagination" may have been used in the planning application. I would be wanting to visit the plot armed with a long tape measure and some stakes to measure out what is really there. Particularly with regards to the parking. Then read your councils policy with regard to amenity space and parking space. It is very likely the 2 sheds are going to have to move elsewhere. A hedge may be your best long term plan, but you need to be patient. I had a BIL who lived on an ordinary estate house on a corner plot. The way the estate was laid out by the developers, they only had a small square enclosed back garden behind the house, but they owned a large grass area alongside the house but open to the road. Any fence there would have been in front of the building line of the adjacent road so would not be allowed. But fortunately a previous owner had planted a Beech hedge all the way round, and then allowed the original fence to fall down. The result was they had a private garden wrapping around 3 sides of the house and way much more space than the tiny original back garden. They are pushing for a decision asap of course - it has taken 3 months to get this far and I suspect they are getting fed up waiting. They'd be good neighbours as they have another house and are away there a lot. Originally and currently the parking is on the front of their house and their garage is where my proposed house will be. I have to move a lampost to create both drives and the planners have written into the approval letter that the parking area must be completed and approved before the house is bought into use. Apologies too if I take time to reply as I'm not getting automatic notification of posts even though I've ticked the 'notify me of replies' box. I guess my biggest fear is that I'd buy it and then somehow not be allowed to build it for some reason I've not understood or any/all of the reasons everyone has outlined above. Of course I'd love to improve it slightly space wise but if the worse came to the worse I could be happy in it just as it is. I think there might be possibilities to challenge some of the decisions because at the moment it's very not disability friendly either. OK @simplepimple, in response to your last 3 posts. (I have actually sketch laid out this morning what I think is a better scheme, but I will leave that for a day or so as we have hit you with a lot of stuff). It is probably to your advantage to have a minimal scheme designed for the PP. If they suddenly came up with something better, they would perhaps want more for the plot. Given what you have posted, I would be reasonably happy that I could develop *something* that meets your needs on that plot, and I would be willing to go toe to toe to get something better through, as I can see no showstoppers. BUt that is my opinion and I have done planning battles. I think the parking is easily fixable .. I would replace it with a side by side parking and a double width driveway, with your privacy fence on the far side of where your tandem parking area is currently indicated. In terms of the sale, I think you need a binding including on successors guarantee that they allow you to put scaffolding on their land as will be necessary to construct a dwelling which has received PP on the plot. NOrmally it could cost a couple of thousand to have it there if you are being charged rent, and if they sell up that might happen or they could just say no. THere may be a time limit say three or five years. I also think you want that silly dog leg in your land where their back gate is in the middle straightened out, but that is perhaps minor. Are you sure they do not plan to sell? IT seems strange to keep it once it is that much smaller, but plan to sell the bigger version including the plot. THe smaller one will be more inadequate. have you considering offering for their whole house, so y get the uplift on the plot .. or is that out of the question? Thank you Ferdinand - all great thoughts. I'm reassured. On the plan from the architect which is the one attached to the contract of sale there isn't a dogleg - the boundary line goes straight across as per your suggestion. Obviously the parking is worse for the host house and in their first application for planning there isn't any provision for parking for them - I guess they are happy parking on their front garden which is what they currently do. I like the idea of side by side parking - much more practical too - although the planners may say that takes the driveway too close to the bend in the road. I've only one car and luckily won't need a fibre glass inspection pit so was wondering about the future possibility having multi use space - so the second car parking space can also be extra garden space at times. If they don't allow turning the house front to back I'd hopefully in future park on the front anyway as long as none of the protesting neighbours dobbed me in! I only have the funds to purchase the plot and probably about 80-90% of the build depending on how it goes - the remaining 10% is likely to be on a small mortgage so buying the house as well isn't possible. Good. Remember my opinion is just an opinion not advice. I wouldn't turn it round ... I would actually treat it as double aspect with the rooms located for sun when you will be in them i.e. Kitchen mainly morning, living all day, bedrooms evening. One nice thing about the plot is that you have obstructions to the light away beyond the road on the sunny sides throughout the day and evening. To add to this thread, as it may be useful. This is a design I sketched out on @simplepimple's plot. I have attached a few prices of something a little more as I would do on that plot. Not to say that it is the only way to do it, but for alternative view and food for thought. It is a little larger by 120sqft but I am not sure that the cost would be much more. It is also a concept rather than complete, for example the way in is not resolved and there are several options. Perso﻿nally I would take it right to the N boundary, create a little more space in the S patio, and adjust a few rooms depending on just what I needed. THere are lots of other possibles. That layout out is still quite unfinished .. it would need input from yourself on things like entrances, and how you want to live. It is amazing how much is added by very little extra area. Eg moving from a 10x10 bedroom to a 11x14 bedroom, What happens is that the amount of perceived space .. eg not taken up by the bed and the door opening .. doubles or triples. It is rather like the perceived size of a car is 70-80% based on the length. On 680sqft or so, you can get 2 nice double bedrooms etc, but there are compromises on other things eg in this layout the kitchen is a bit tight and the south garden is reduced. A perforated screening wall on the building line may be the solution. It will need all need a lot of thought. If the bungalow went right to the top of the plot, you could have 3 bedrooms if really needed, but that extra space might be better in the south garden. You could also have a modest path all the way round for maintenance, but since you only have one neighbour who has paths or driveways on nearly your entire boundary, relying on that is prob. Preferable. One of my pet hates with traditional bungalows is the square floor plan which wastes a good chuck of area on corridor and give you 2+ room depths in a small house - for me, one nice to have is a single room depth of house (so probably an L shape on this site) but it allows a dual aspect in the public rooms which always makes a small house feel bigger.